If you dare tangle with "Dragon's Breath," you're sure to get burned! 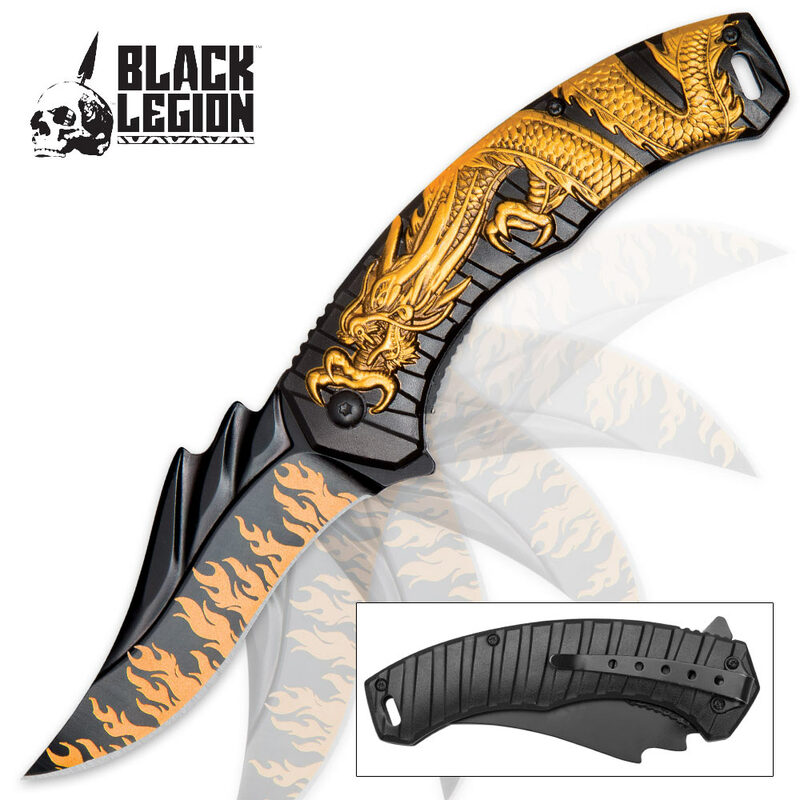 This cool new pocket knife from Black Legion boasts a razor sharp 3 3/4" 3Cr13 stainless steel blade, black with gold-colored flames licking up the sides from the finely honed, gracefully curved edge. With a gentle nudge of the flipper or thumb stud, the blade swings open with the speed of flames engulfing dry leaves, thanks to the advanced assisted opening mechanism. 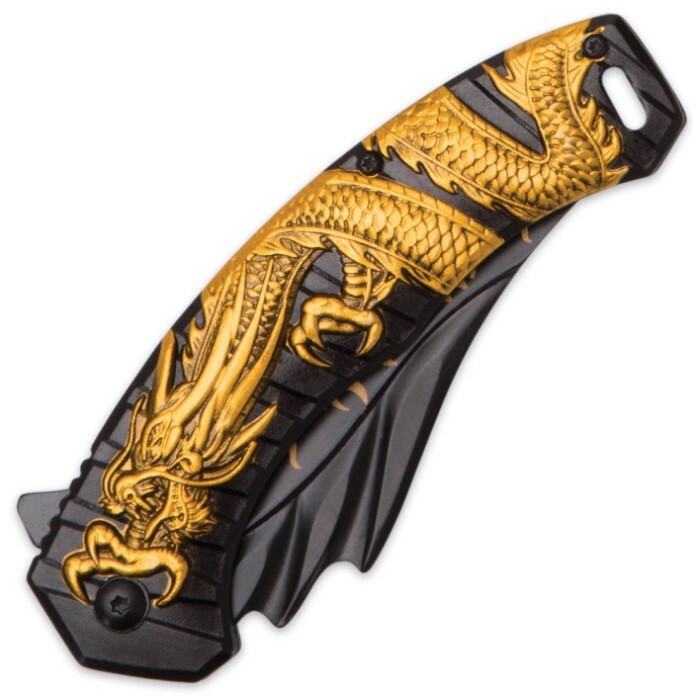 The blade spine is carefully molded into a cool three-dimensional dragon crest, the perfect complement for the brilliant, iridescent gold dragon motif on the black aluminum handle. Loaded with countless fine details like scales, talons and spikes, the Chinese-style dragon slithers along the ribbed handle in striking raised relief. At 4 3/4" closed, the Golden Dragon's Breath Pocket Knife fits comfortably in jeans pockets and stays in place with the integrated aluminum pocket clip. You can also hang it around your neck or secure it to a backpack with the handy lanyard ring. 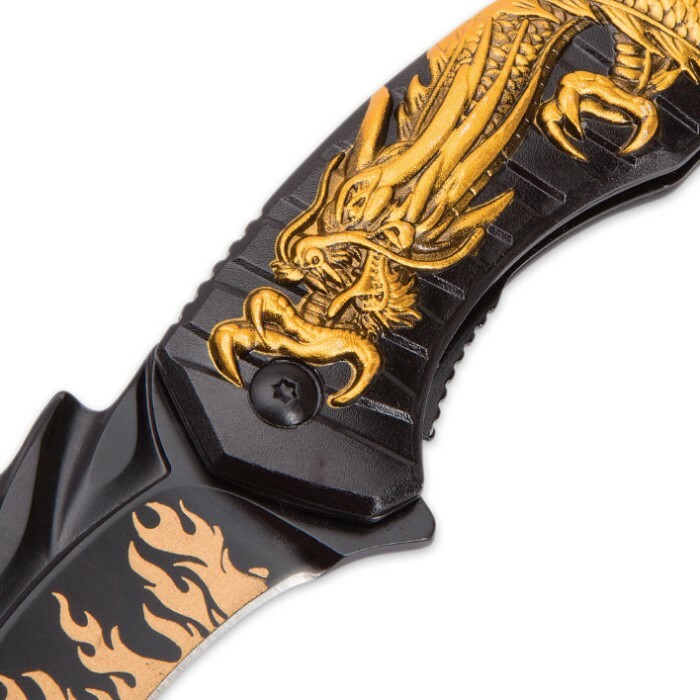 Whether you display it or wield it, Black Legion's Golden Dragon's Breath Assisted Opening Pocket Knife is sure to turn heads and burn any foe who draws too close to its blazing weaponry. The knife is very good looking the paint job could be better came all oiled up for 5.99$ it is seriously like a steal I wouldn't use it as a everyday carry knife but for something to show off it will drop jaws like the dude below me I too also want to see more in stock. I purchased all three but the gold is by far my favorite. Here's hoping they restock.